Maximum occupancy in a studio - 2 persons on regular beds plus 1 on an extra bed. Maximum occupancy in a 1-bedroom apartment - 2 persons on regular beds plus 2 on extra beds. Maximum occupancy in a 2-bedroom apartment - 4 persons on regular beds plus 2 on extra beds. “Blue Marinе” Apart Hotel (Sunny Beach) is located less than 150 meters from the beach and on the second line in the southern part of the resort just a few minutes walk from Cacao Beach. Bourgas Airport is situated 30km away from Blue Marine Apart Hotel. “Blue Marin” Apart Hotel is situated in a quiet place just 2-3 minutes walk from the golden sand beach of the most popular Bulgarian Black Sea resort - Sunny Beach. Around the complex you will find numerous restaurants, bars and supermarkets, as well as other attractions that will make your summer vacation an exciting and unforgettable experience. No more than 5 minutes walk from “Blue Marin” Apart Hotel is located Cacao Beach, where are the most popular clubs in Sunny Beach. In the summer there are visits from the best DJs in the world. 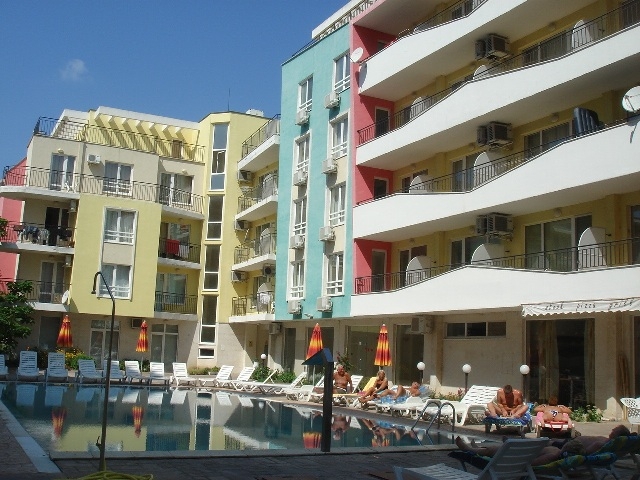 The complex is situated in a very convenient location, near a bus stop, through which quickly and easily you can reach the nearby resorts of Nessebar and St. Vlas, where you will find many other entertainments. “Blue Marin” Apart Hotel is a gated community that has its own pool area with sun beds where you will be able to escape from the crowds on the beach. N.B. extras are not combined with E.B.